Following this defining moment, the author, accompanied by her dachshund George, spent every spare moment watching deer - red, sika and roe but mostly the beautiful fallow deer. She observed the deer in all weathers, how they interacted with each other or with other wild creatures amongst the New Forest's ancient stands of oak and beech. Buckie's contacts with a variety of people such as those who befriend him, the local keepers and poachers are all described in realistic detail. Every November the author went to the New Forest to observe the rut, an exciting time in the deer world, when the great belching roars echoed out over twilight in autumnal woods, evoking a thrill of pleasure. 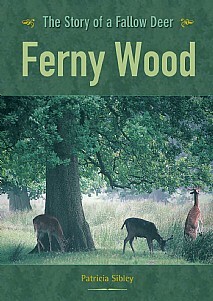 Ferny Wood is a closely observed, lovingly detailed account of a deer's first three years of life and also an illuminating portrait of a forest in all its moods. A book that is sure to be of great appeal to enthusiasts of wildlife, the natural world and the environment - a thoroughly enjoyable story that provides an insight into forest life and deer in particular. 'This is a lovely, well-written book, nicely illustrated with colour and monochrome photographs, which will be of interest to both Forest dwellers and visitors alike. ...it is a truly beautiful legacy, whose sensitive observations of New Forest wildlife will be enjoyed by Forest lovers for many years to come'. New Milton Advertiser and Lymington Times.